Redsofa found these two crab claws on the beach in Ireland. They were native to the magnificent Donegal county and swam in the cold Atlantic waters of the north. Waiting for a second life, far away from their original land, imprints were taken and they were cast in solid sterling silver. Like friends or lovers, they will be Together Forever, hence the title name of this piece. 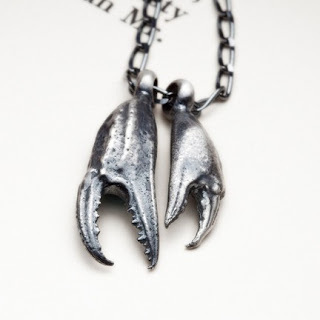 This necklace can be worn by both men and women alike. It looks even more striking when worn with other necklaces or chains you already love, especially gold for contrast. Lavender has been used since time immemorial for everything from insomnia to scented bed linens…but this is the only lavender lampshade we know of. Dried lavender flowers have been embedded in layers of mulberry paper, gauze, and tissue to create this beautiful shade. Approx. 28" circumference, 8.5" tall and 8" diameter. Opening to fit on lamp is a standard 1.5" and can be cut larger by request. 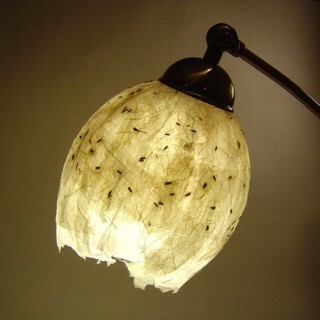 Designed to be used with a single energy saving fluorescent bulb. Don't worry you don't need to pay each time you use this fun, useful mini cushion! Just pop in your pin, (or lots of pins) to keep them safe and at hand! It measures 12cm x 12cm and is made from calico cotton and handpainted with fabric paint. Would make a fun gift for any sewing lover. This has been on heavy rotation on the Folksy front page this last few days, but it would be a shame to let it go without a mention! I met the very talented Pam from Buri Boo yesterday at the KAF Folksy event, she works in a variety of media and her stall looked absolutely fantastic. There were loads of new items on display that you won't find online – this little laser cut acrylic birdie brooch being one of them. I couldn't resist taking a quick snap of this one, I love the way that the map makes it completely unique. If you love this brooch I'm sure that you'll be able to purchase it if you send Pam a nice email! 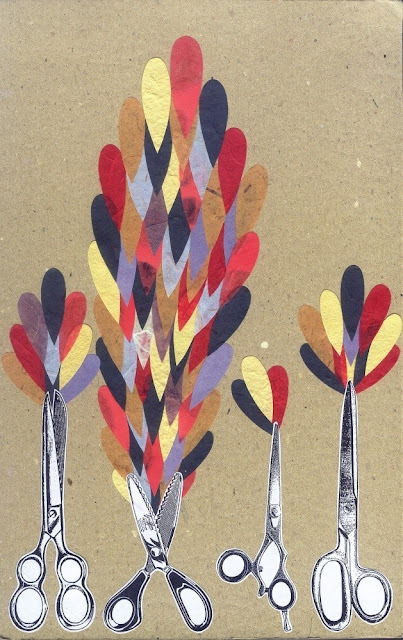 Created in just one Sunday afternoon in the park, this beautiful collage has now been turned into a print that everyone can own – and it ships all the way from Jakarta! 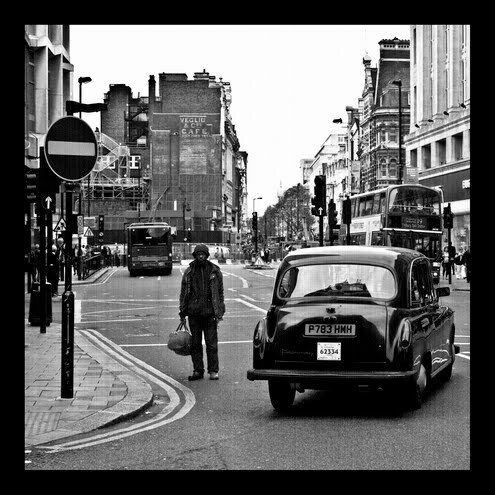 Printed on 210gsm cream matte paper this 8.5" x 11" print is signed and dated by the artist. Ideal for summer holidays, this funky furoshiki (Japanese style fabric wrap) can be used to create a variety of bags – just fold and knot and you're ready to go! This cotton fabric can be used over and over so when you want a change, undo the knots and make a new bag – a spacious shoulder bag, a casual handbag, a gorgeous 'green' grocery bag – the choice is yours. There are loads of colour options available, click on the link below to visit the store. Meant for the seeker of freedom, watcher of birds, believer in angels, and for those angels here on earth that occasionally cross our paths if we are so fortunate. 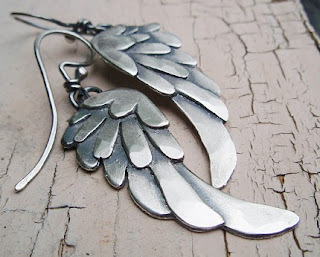 These earring wings are each about 1 1/4" long by 1/2" wide, made from sterling silver, substantial yet light enough for comfortable wear. Produced and hand finished in limited quantities, each earring is unique. 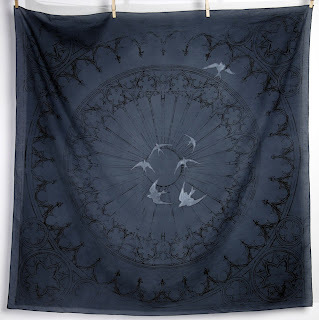 Screen printed on 100% cotton voile, piece-dyed dark slate blue, with a slight ombre effect, being lighter in the center. Dark blue trim. Approx. 42" x 42". Hand printed in Portland Oregon. Beautiful. These beautiful bowls are made by Rowena Gilbert. Rowena adds metal oxides to create colour, then brushes the coloured clay layers onto the slip cast vessel or inlays it in incised lines and marks. The surface marks are created using various sgraffito tools when the clay vessel is in a leather-hard state. Rowena bisque fires, then masks areas on the outside of the vessel using wax resist, glazing the inside and the unmasked areas with a transparent gloss with the final firing at 1160°C. All pieces have Rowena's signature mark on the base. 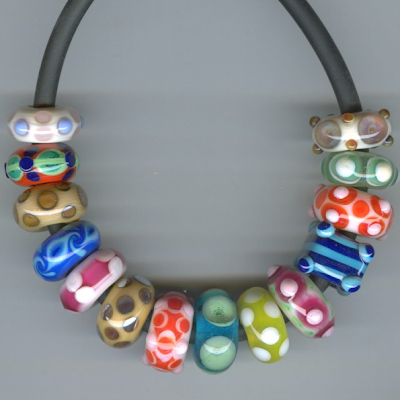 Rather than choose just one bead from Beth's shop, I decided on this set of 14 orphan beads to show the vast range of bright colours that Beth uses in her work. These are bargain beads that were placed in the orphan stash because they were either too big or too little to be used as bracelet beads or because they have minor flaws. All of these beads were handmade using Moretti and Double Helix glass. They have been kiln annealed and dremel cleaned. They were made on large mandrels and have large 5 mm holes. Bargain! 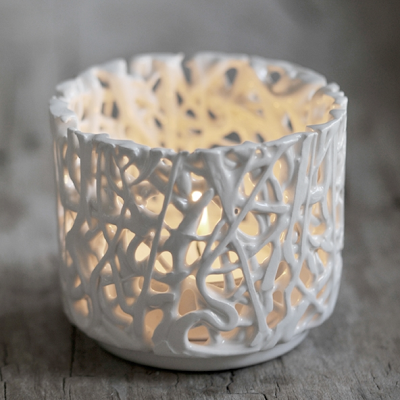 This beautiful tealight holder creates a magical ambiance as the candlelight shines through the intricate gaps of the 'tangled' pattern. This special piece will bring detail and elegance to your wedding table setting, creating a romantic mood for your extraordinary day. Or if you are attending a wedding this summer then look no further for that ideal gift, this piece will be treasured and loved by the happy couple. Each piece is individually hand crafted by Timea Sido using fine white earthenware with an off white gloss glaze finish. Height: 5cm, Diameter: 6 cm. This is a tin thing! A small papier mache figure in a vintage tin. 10 cms high and 16cms across with lid open and 8cms shut. Beautiful! "El amour de la tierra" (Love of the Earth) is an ode to the Earth & her inhabitants. This blank card was lovingly handstitched and foil stamped using handset type on handmade hemp paper. Each card is uniquely shaped with naturally torn edges. The card is blank inside, leaving you space to write your personal message. Accompanied by a 100% recycled craft envelope and "packaged" with hemp string holding the two together. Every step in the creation of this card was crafted the oldworld way (except the digitally printed heart) using handtools: awl, needle & thread, ruler, and a bone folder. 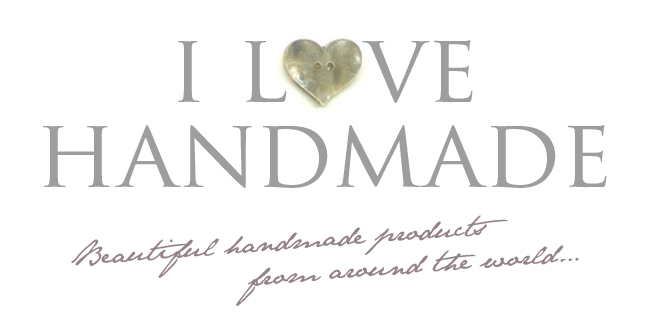 Made with careful consideration for the environment and lots of love in every stitch! 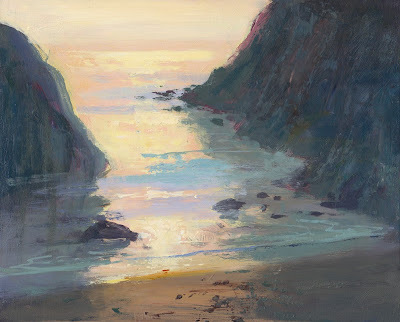 This beautiful archival giclée print measures 11 inches x 14 inches and includes a white border for framing. Simply place it in a frame and you're good to go. Printed on professional digital art paper with archival ink. Signed and dated by the artist. Colourful one of a kind embroidered wall decoration. Shades of blue, lime green, orange, yellow and red, hand stitched onto 100% cotton canvas fabric. 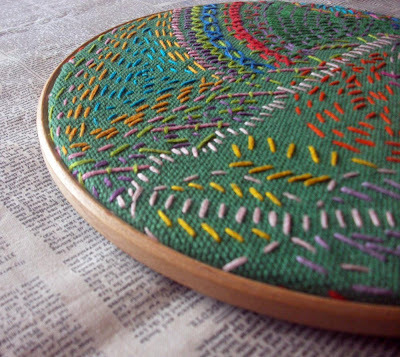 9 inches diameter wooden embroidery hoop. The Happy Mac icon which was designed in the 1980's and still looks lovely nearly 30 years on, is great to cover your iPod or iPhone! This pouch is handstitched, not even a sewing machine has touched its body! The case measures 12.5cm length, 8cm wide and will fit the iPhone and iPod Touch. This grey felt sleeve is made of very strong thick durable felt. Due to each and every Egoor being handmade and unique, not all are identical but of course very very similar! It is the Egoor family genes! Original acrylic painting. 8"x10". 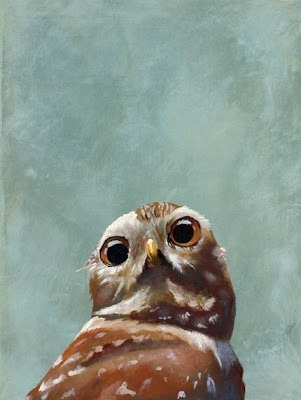 This very beautiful little painting was featured yesterday on the Etsy Finds email. I love the light, it's absolutely stunning. It sold before I could get to it! Before I even saw it! Bah! 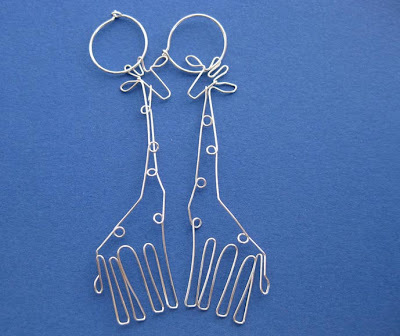 These little giraffes are sterling silver, and swing merrily from tiny earring hoops. Each pair is handmade and therefore unique. Hoops are approximately 5/8" in diameter. Entire earring length is just under 2" long. The earrings come attached to a hanging card with an 100% recycled kraft paper covered box, perfect for a gift! This letterpress print is printed in three colours with a fourth, clear tint, used to discreetly print the enormouschampion logo at the bottom. Comes with a man-made paper vellum dust jacket with the words, "wishing you..." printed on. 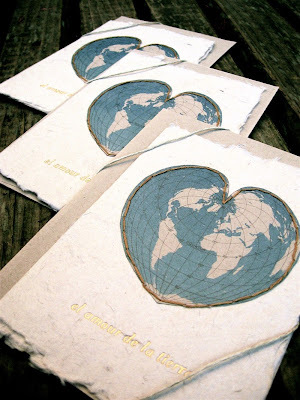 This dust jacket protects the print, but also makes it perfect for a well wishing card & gift in one. 8" x 10". Signed and limited to 200. Drawn, designed, and printed by enormouschampion. 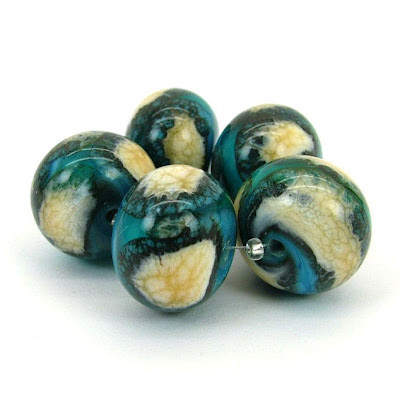 A beautiful set of 5 handmade lampwork beads in a beautiful rich blend of ocean blue and teal with organic ivory. The beads measure approx 14mm in diameter with 2mm holes. 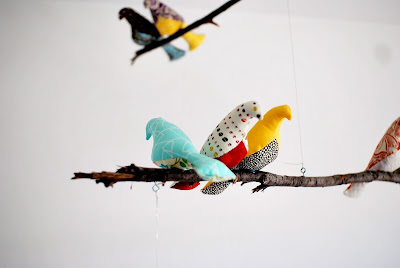 Gorgeous hand-made bird mobile. 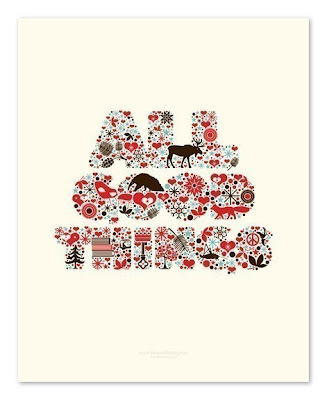 A beautiful addition to any room (especially a nursery). Real tree branches delicately balance hand made birds which are totally customisable to your choice of colours. Fantastic! 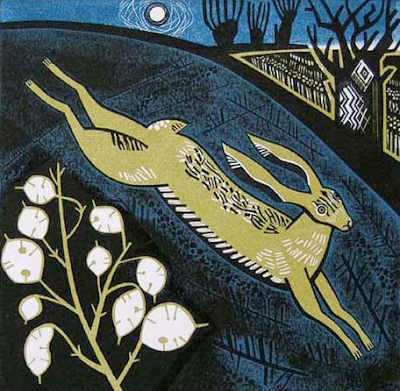 I absolutely love this beautiful 225 mm x 225mm lino cut by Clare Curtis. Clare lives in Suffolk by the sea, in the house which she grew up in and which originally belonged to her grandfather. She exhibits her prints all around the UK but also has the "pleasure of working with and for individuals who share my enthusiasm for printing". Fantastic! This really is the perfect present for the comic lover in your life! 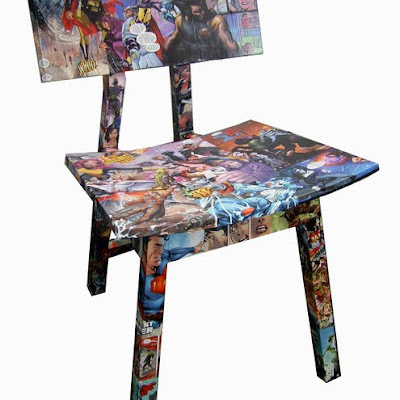 This is a chair discovered in a charity shop and, with patience and decision, completely decoupaged with images from graphic novels. Each chair produced is absolutely individual and unique. Need a bit of extra love or know someone who does? 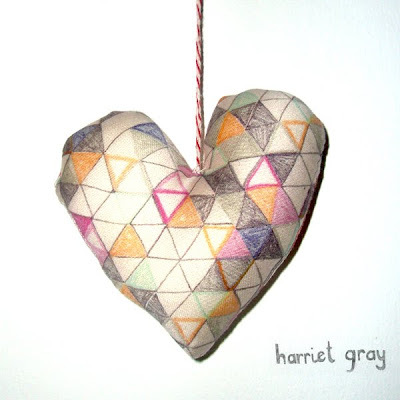 This Mini Heart ornament by Harriet Gray is made from the artist’s pink flamingo love fabric backed with a triangle design (shown here). Each heart varies slightly due to the hand made nature of the design. All fabric is custom printed on 100% organic cotton, generously stuffed with hollow fibre filling and hand-sewn. 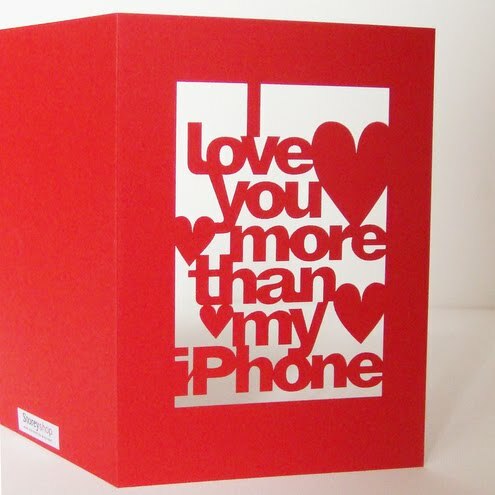 Let that special person know that you do, in fact, love them more than your passion for your beauuutiful phone! Cut from bright red card and lined with a textured white paper inlay which is left blank for your message. 100% original design which is very tactile and looks especially nice when light shines through it. Other slogans are also available in the limited edition machine cut range, or you can have your very own bespoke message hand cut, yes hand cut, for a very, very reasonable price. Such a sweet little garden for a trio of tiny tweeters – can you spot them in amongst the twisted leaves and branches? 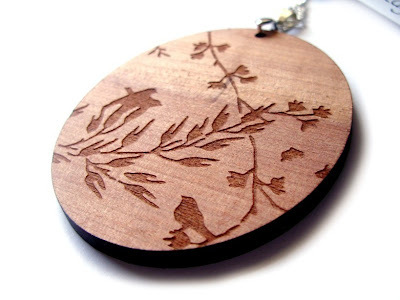 This beautiful Tasmanian Myrtle wood pendant has been laser cut and engraved and looks fantastic! Silver-finish chain: 36cm. Wooden pendant: 6.5cm. 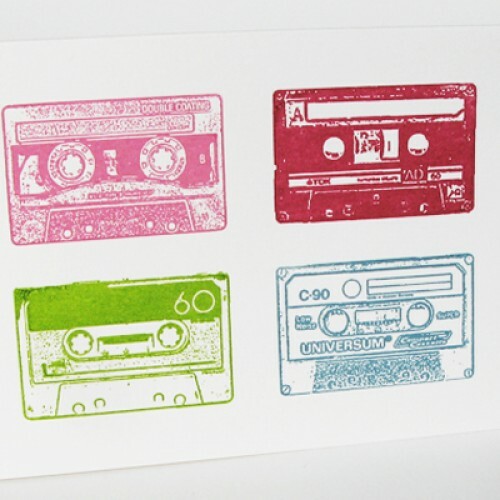 I miss the clumsiness of cassette tapes, having to fast forward for what what seemed like an age to find that one track you loved. The cassette player eating your tape. 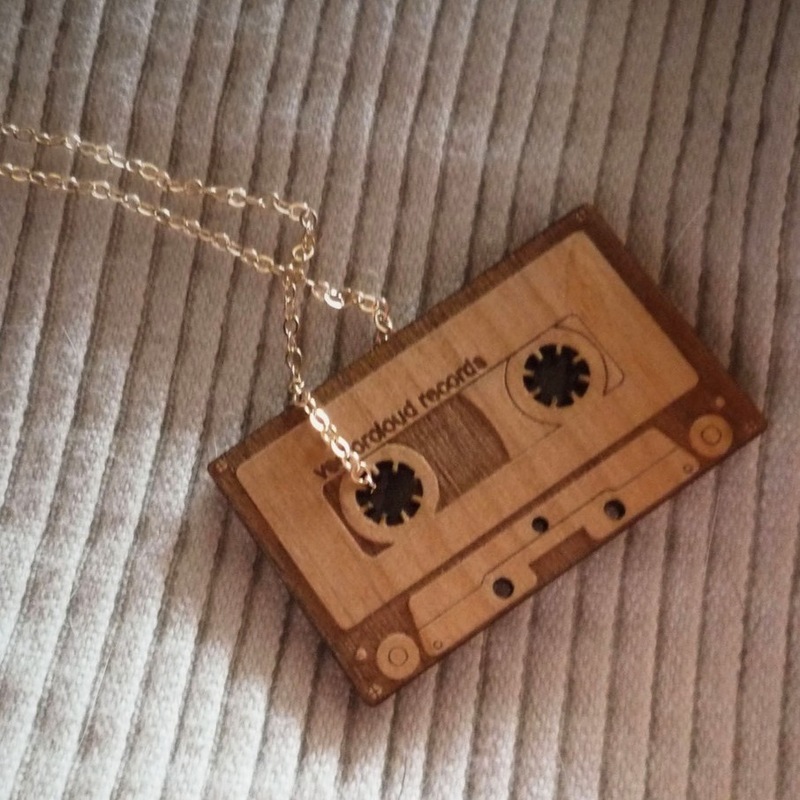 Then someone would give you a mix tape that they'd made just for you. Happy days! This fantastic five card set features this four colour gocco design. You can send some to your best friends and keep one to frame. Due to the nature of gocco, each card is unique too! 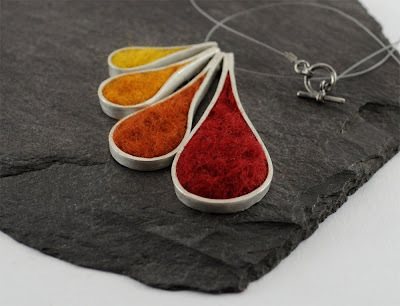 A fine silver and merino wool felt necklace. The largest pendant is 5cm from top to bottom and the smallest is 2.5cm. They are hung together on stainless steel nylon coated wire (soft to the touch) with a lightly oxidised sterling silver ring and bar clasp. Bright and cheerful, but still grown up. How can you resist those colours together? Standard length approximately 45cm (plus the drop of the pendants).